Removing or trimming any heavy tree limbs hanging over your outside AC condenser before the storm. Clearing your HVAC system and its electrical hookups from obvious impact. In the event that wind damages your outdoor electrical ports, it might increase the risk of catastrophic power failures and fires. Prone to flooding? 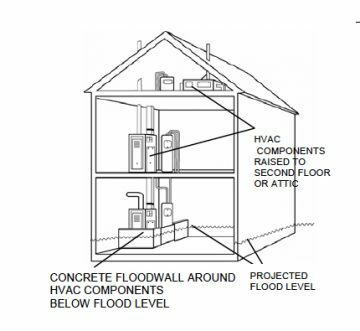 Consider raising your HVAC to a higher level or building a protective floodwall. Move HVAC equipment to an upper floor or even to the attic, if your house has those features. Or, build a concrete or masonry block floodwall around your equipment. More preparedness measures include raising the main electric switch box, electric outlets, switches, light sockets, and/or wiring; elevating the washer and dryer, and anchoring fuel tanks. Turn off your AC at the thermostat if water is coming up the driveway and into the yard. It may not be that comfortable as heat and humidity rises, but it can help preserve your electrical system and the HVAC outside condensing unit. If your home is starting to flood take the next step and turn the power off at the breaker box to prevent electrical shorts and to keep you and your family safe. If your air conditioning condensing unit had been submerged please call us at 941-955-COOl (2665) immediately. This is for your safety. Consider having your system thoroughly cleaned of any mud, dirt, leaves, and debris. If your HVAC system ‘acts funny’ post-storm it’s possible that there has been damage to various electrical parts from power surges, system flooding or even lightning strikes. We can inspect your system and offer solutions. If your system is not working right after a storm or hurricane – no matter how big or small a problem – give us a call and we will promptly come to your aid. Find us at 941-955-COOl (2665) or online at https://customclimateconcepts.com.